cost you are currently paying. Personalize every , text, image and action. Solutions for the enterprise market to engage users and clients. SMS A2P, SMS 2 way, landing pages, Voice Broadcast, text2speech, IVR, Sms2Call and Click2call and can deliver those services worldwide. INCREASE YOUR ROI reducing your CPA, increasing your open and conversion rates and improving the overall customer experience. Here some of the key features. calls in multiple languages, and interactive landing pages for mobile devices complete with powerful and user-friendly analytics which track the real time performance of your communication campaigns. Go4Clients’ powerful toolset allows companies to more effectively market, sell, service & survey. Our TCPA Compliant Messenger provides a legal alternative for mass marketing to consumers that have not opted-in to receive an SMS marketing offer from your organization. With no licensing costs or maintenance fees and simple APIs, Go4Clients provides a true out of the box solution that can be used the moment you sign- ! With a 98% open rate within 90 seconds, see how Personalized SMS messaging can hyper-charge your sales efforts. Build mobile landing pages in minutes and push Content, Video, Capture Data and Complete Transactions. Even more, personalized every image, text and action so your user can have a unique experience. Send all the information collected directly to your CRM. Eliminate extended hold times, customer frustration and call queues by offering customers the option to “Press 1” to receive a call back from the next available agent of your Call Center. Generate a call from your agents to your prospects as soon as your prospect opens the landing page or execute an predefined action. All the user’s information is sent to your CRM so you can initiate the call whenever you want. IVR (Interactive Voice Response) allows customers to interact with you over the phone using their keypad. 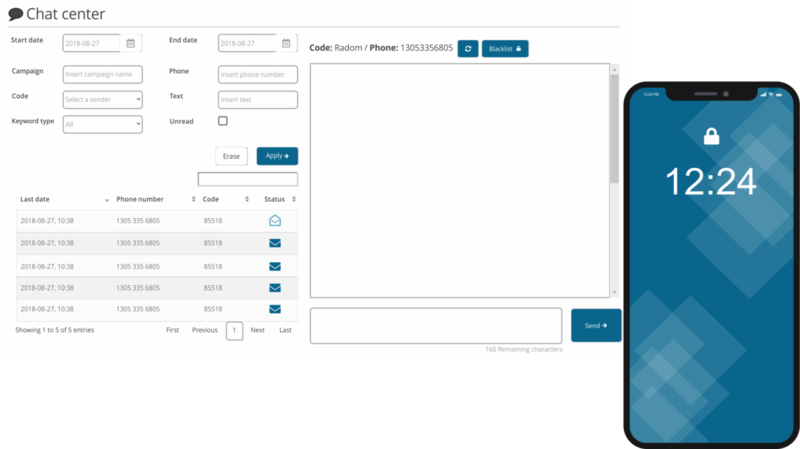 Using our API´s, now you can integrate your CRM or Call Center with Go4 Clients. You will be able to launch campaigns directly from your CRM or Call Center and receive the information provided by the user in your CRM or Call Center. You will integrate your marketing campaigns with your business workflows. Bring s port to your customers by adding new effective communications channels like advanced SMS s port, IVR, Surveys and creative Landing Pages. 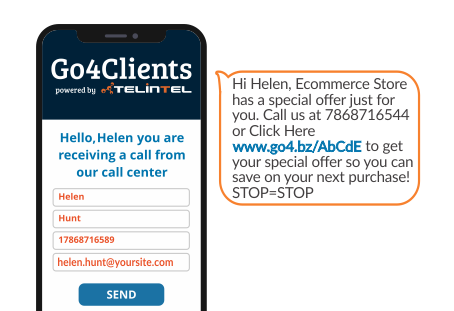 Generate marketing campaigns by using our Personalized SMS and Landing pages campaigns, all fully TCPA compliant and ready to go, you can set them in less than 5 minutes. On time payments, alerts, promotions or discounts? Improve your communication and keep in touch with your customers on time by using their preferred channels. Our products are TCPA complaint. With SMS and Voice Broadcast you to reach thousands of prospects in minutes and with Landing Pages and IVR you can run surveys to filter and convert those prospects in valuable leads.